Each work of art is an original print: a one-of-a-kind, hand-painted drypoint engraving. This intricate process dates back to the 15th century. It requires a great deal of time and patience, in addition to strength and experience, and creates a wonderfully textured, archival piece of artwork. All work is completed by Tim in the studio. 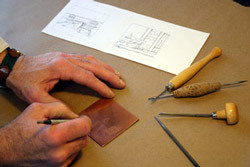 Drypoint engraving is a method of intaglio printmaking. The lines are incised onto a copper plate using various sharp pointed tools. The image is carved or scratched into the copper in reverse, as it is a direct print. The drypoint line is created as the tools push through the copper, forming what's called a "v-groove" that displaces the copper to either side of the line and creates a ridge, which is called the burr. 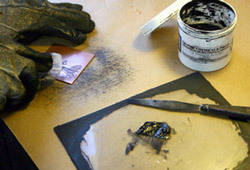 Ink will catch underneath the burr as well as in the line, giving the drypoint line its characteristic soft, velvety appearance absent in the clean edged, acid bitten lines of an etching. Once the plate is completed, black ink is applied. He takes a cloth and wipes the excess ink off, leaving the ink inside the lines. The plate lays flat on a crank press bed, facing up. BFK Rives paper, 100% rag paper made in France, is dampened and placed onto the inked plate. Pressure is made by hand cranking the wheel of his press and pulling the bed through. The paper molds itself to the shape of the plate by sliding through the rollers. This creates the black and white impression of the engraving. After the ink dries, he paints using transparent watercolor to complete the image. All of the engravings are individually inked, hand pulled and painted. Each one will be slightly different and unique from any other number in the edition. The engravings are limited to an edition of 100, with a few Artist Proofs. 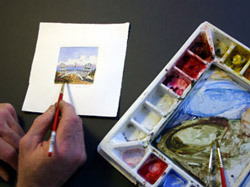 The watercolor allows him to alter the backgrounds or seasons on some of the images, creating a variable edition. 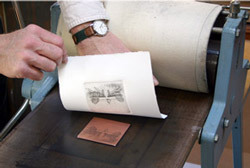 Retired plates are often framed in a grouping entitled the Bon A Tirer which showcases the original copper plate, the proof print, and the final watercolored image. Translated from French Bon A Tirer means "good to pull" or "good to print" and refers to the printmaker's proofing of a plate.